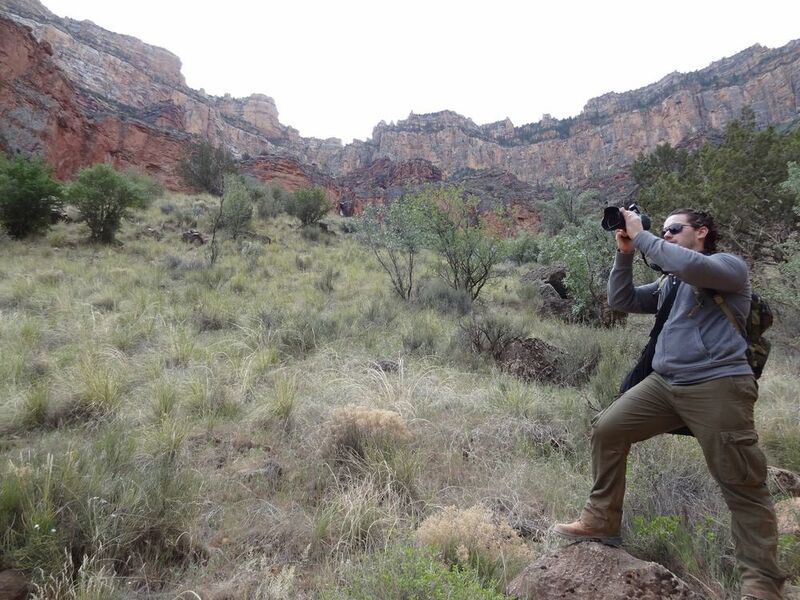 Apparently, I've been to the Grand Canyon. I don't remember because my memory is about as good as that of a goldfish, plus it seems I was quite young, but there are photos that prove that I was once there. Even though Josh and I are married now, he had never been to my home state of Arizona until this past April so we decided to see as much s possible. We flew from NYC to PHX, hopped in a rental car, picked up a Canon wide angle lens from Tempe Camera, and drove 4.5 hours to the Grand Canyon. We caught out first glimpse of this Natural Wonder just as the sun was setting. Sunset, sunrise, and thunderstorms are some of the things I miss most about AZ. We woke up early the next morning to eat some breakfast and get a move on the fairly strenuous hike we had planned. 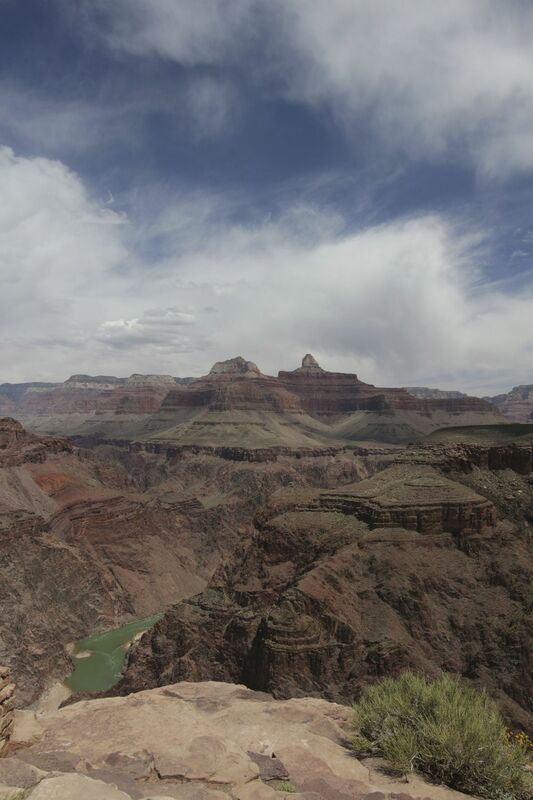 In the lower middle of the photo above, you can see a triangle that juts out into the middle of the canyon with a path that leads to Plateau Point. That's where we were headed! 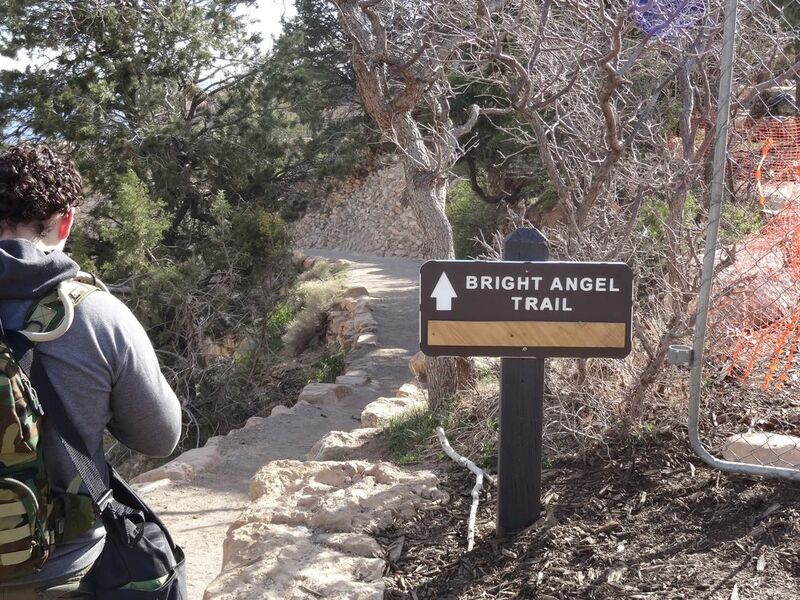 The Bright Angel Trail is one of the trails that you can take if you want to go all the way to the Colorado River. 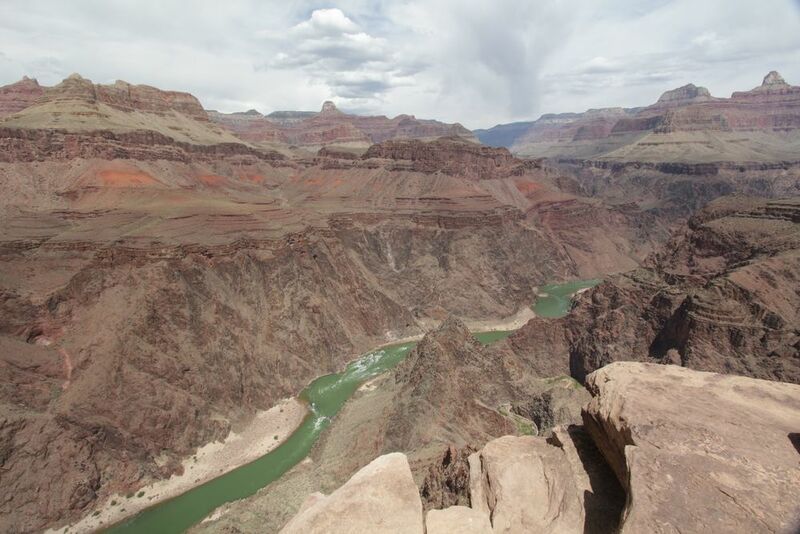 There are campgrounds below and also a lodge, Phantom Ranch, if you don't want to haul camping gear with you. If we had a little more forethought, it would have been wonderful to spend a night at the ranch, but the rooms get booked almost a year in advance! The National Park Service and many other websites I looked at VERY STRONGLY advise against hiking to the river and back in one day. It's 9.5 miles to get to from the rim to the river and, don't forget, you still have to climb back out. 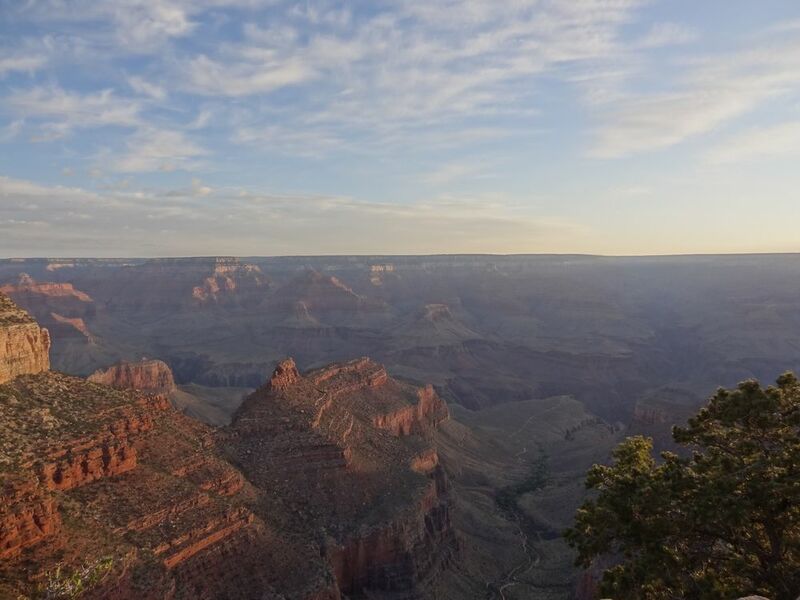 We chose to go just to Plateau Point which is a little over 6 miles from the rim, almost 13 miles to get there and back. As we started on the trail, there were some cool cliff cut-outs and, of course, we had to stop someone to take a picture of us. 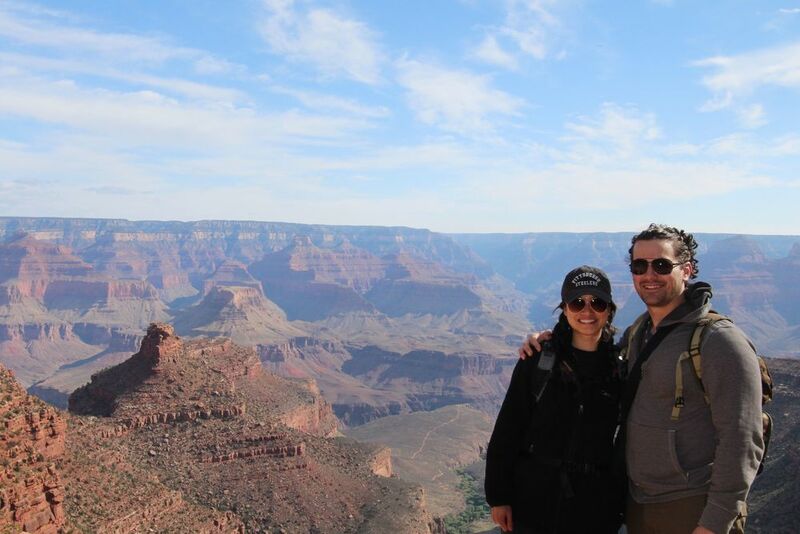 Since the canyon is such a beautiful destination, no one was shy about asking other people to take photos of them, including us. Josh has been having a great time learning how to use the Canon EOS Rebel T4i that I got him last year for his birthday. Check out the two photos above. The tiniest tweaks can completely change a photo. Isn't that bottom one just amazing? The rocks are so red and the clouds lead the eye towards the endless horizon. Beautiful! The canyon face is quite steep and the trail is filled with switchbacks, where the path goes side to side to help you descend. If it didn't, you'd be rock climbing instead of hiking. It's also for the mules that carry supplies and hikers down to the river. 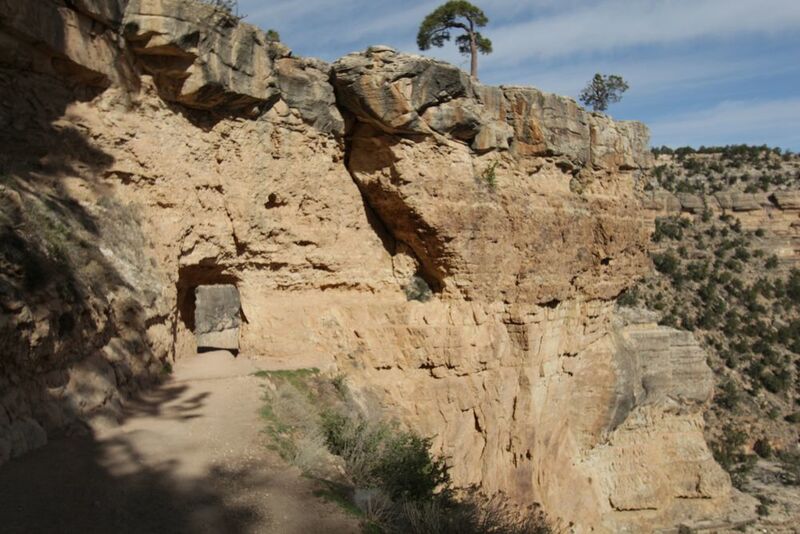 Instead of hiking, you can take a mule ride to Phantom Ranch. I'm very sad to say that we didn't actually see any mules on the trail. I really wanted to see them! Plenty of mule poop, but no actual mules were spotted. We made sure to rest a little at almost all of the rest points, drank lots of water and gatorade, and ate our trail mix and beef jerky snacks. There was water at most of the stops so the easiest way to carry gatorade with us was to bring the powder packets. My mom thought it was weird that we snacked of beef jerky, but it's a great way to replace the salt lost from sweating. Plus, who doesn't like to have an excuse to buy a huge bag of beef jerky? 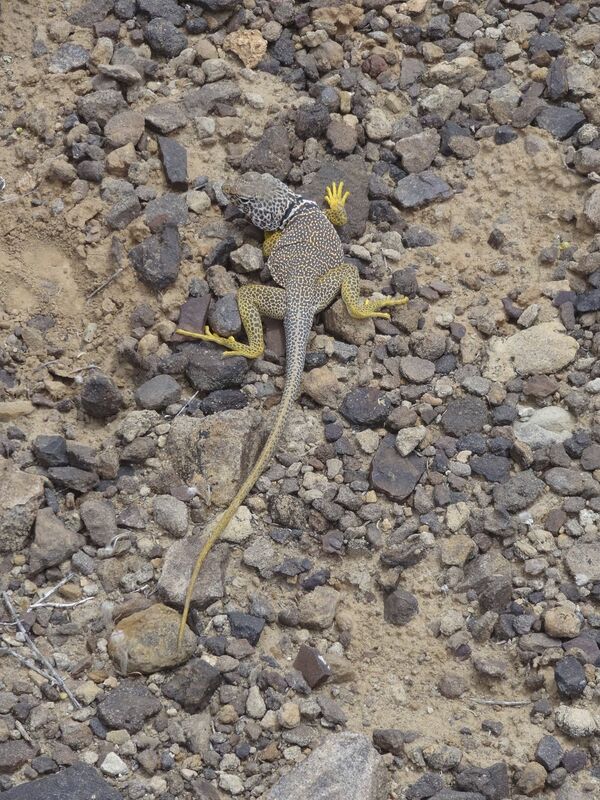 Check out this lizard! Josh thinks lizards are pretty awesome. Way before we met, he had two bearded dragons as pets and they were named Roquefort and Brie. Can you tell Josh likes cheese? He tried not to take a photo of EVERY lizard he saw, but this little guy was too cool not to photograph. Prickly Pear flowers were just starting to bloom. They are such a beautiful color! 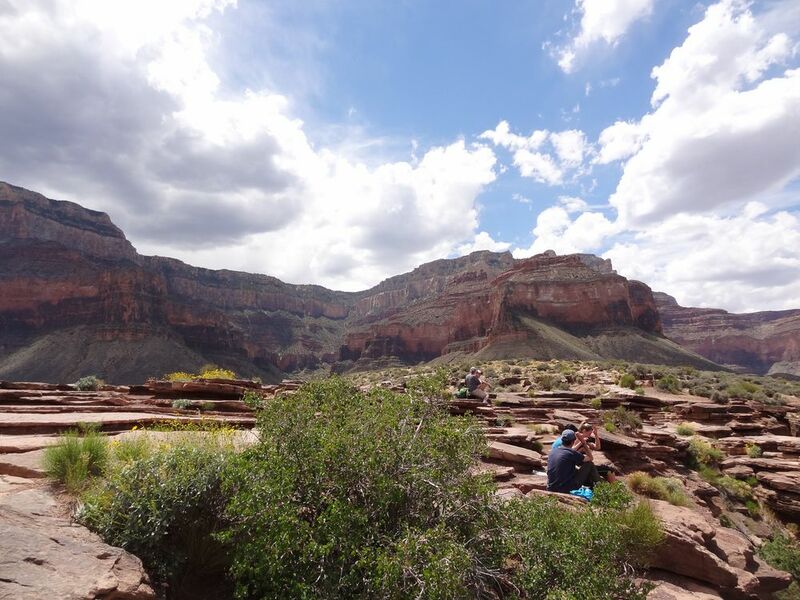 The view at Plateau Point was stunning!!! 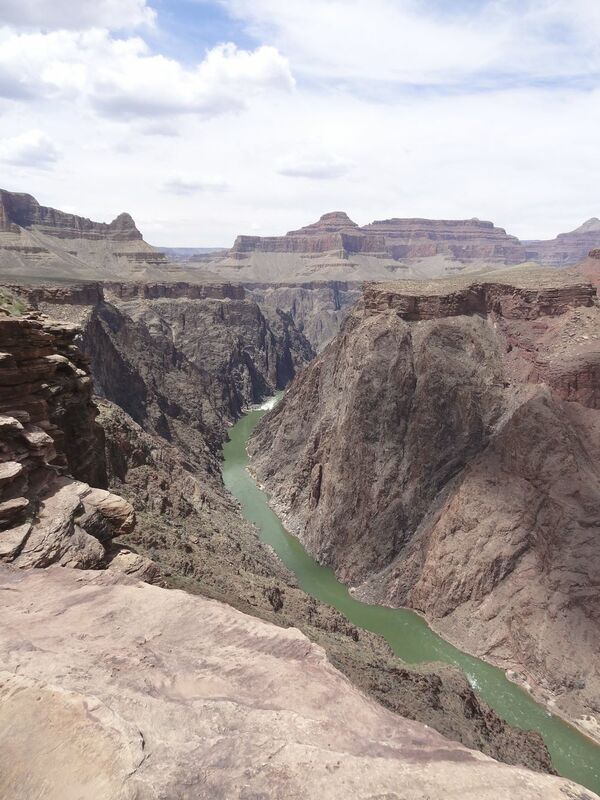 Seeing the Colorado river flowing down below just sears into your mind how astounding Mother Nature is. The river seems so small and skinny when compared to the vastness of the canyon, but the water has patiently etched away at the earth over millions of years to create this immense thing of beauty. 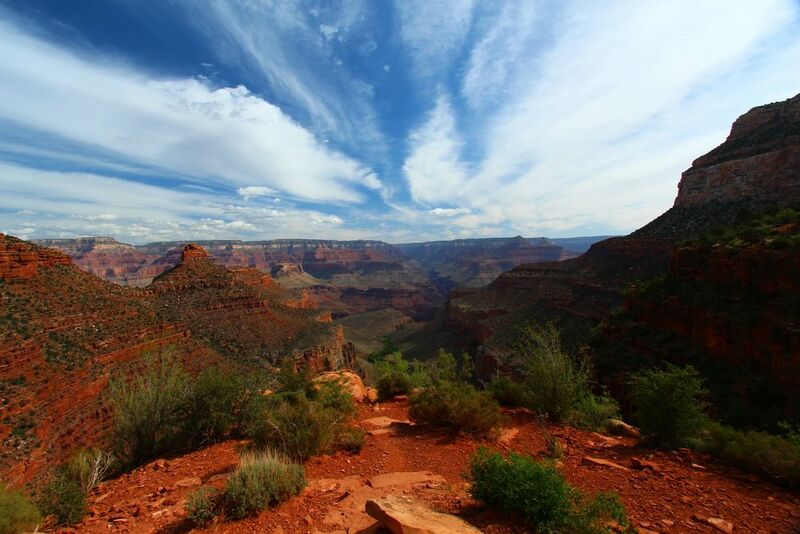 Can you believe that it's only six miles from the point way up there on the rim? It looks so far away! While Josh played with his camera, I squeezed in some playtime for myself. 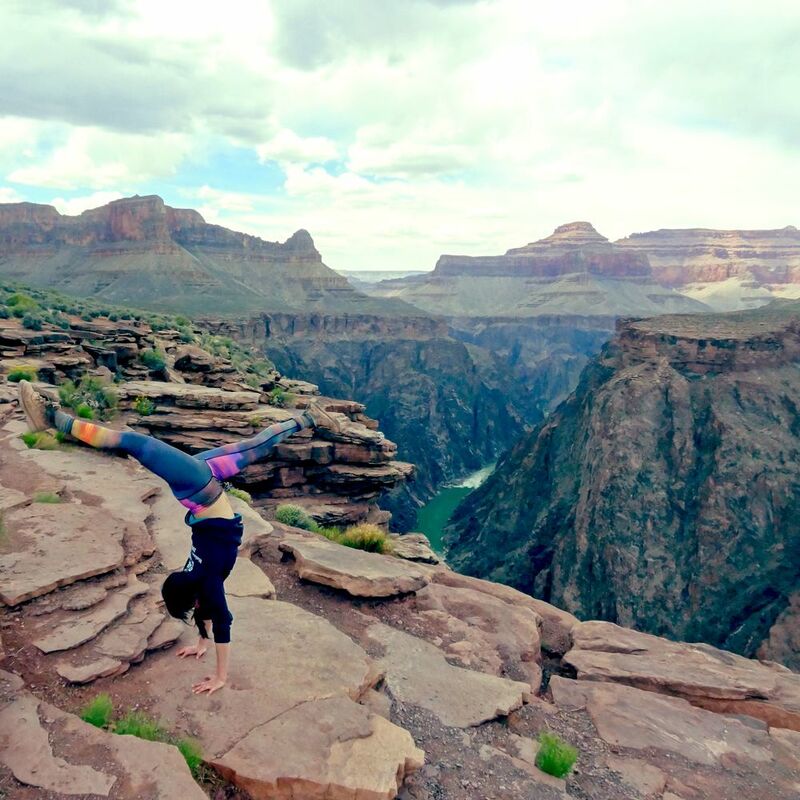 Handstands! Josh is wondering where his martini is right about now. Just six more miles, this time uphill with a brief thunderstorm, and then you can have that martini.